Ever since she and her daughter Shana were raped 16 years earlier, Lily Forrester’s relationship with her daughter has had more than its shares of ups and downs. Now 28, Shana is following in her mother’s footsteps and studying to obtain a law degree at Stanford. After her boyfriend dumps her, Shana starts to have a melt down and finally lets her mother have a glimpse into her private life. Dismayed by her daughter’s weight loss, uncleanliness of her apartment, and lack of attention to her studies, Lily panics and drops her daughter off at the first mental institution she can find online. Shana knows that she is not crazy. She also knows that she would not willingly admit herself into such an institution, and is appalled that her mother would do this to her. Pumped up on various drugs, Shana is having a hard time deciphering reality from hallucinations. In moments when she is lucid, Shana begins to detect that something sinister is happening at Whitewall. Are other patients besides Shana being held against their will? As Shana begins to fall in love with a patient that comes and goes from Whitewall as he pleases, she comes closer to uncovering an highly illegal practice that may be the death of her. 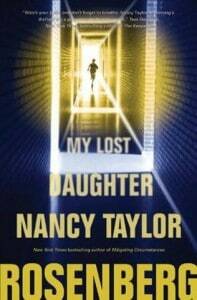 Before requesting this book for review, I had no idea that My Lost Daughter by Nancy Taylor Rosenberg was the 4th book in an ongoing series. To her credit, Rosenberg more than adequately caught up any new readers to Lily’s and Shana’s past through italicized flashbacks. I am unclear if these passages, which dealt with their rapes and the aftermath, were taken straight from another book or were new text solely for this book. These sections were rather lengthy, and I personally would have preferred it if they had been shorter; they just didn’t feel all that necessary since the incident was also referenced in the rest of the novel. Anyone else who is new to her books will not feel lost regarding Lily and Shana and their stormy relationship. In addition to Lily and Shana, My Lost Daughter also follows a friend of Lily’s, Mary Stevens. Scenes involving her were very short and almost pointless. It’s only in the end where the reader learns of her investigation’s connection to Shana’s horrifying stay in the mental institution. Mary was not nearly as well fleshed out as Lily and Shana, and I felt I had started her story right in the middle. There just seemed to be way too much going on in this book. I felt like the author had some really great topics to cover that could probably have been spaced out over 3-4 books. Instead, they were all crammed into this one and it just made a huge mess, in my opinion. The case I was especially interested in regarding a young mother who allegedly poisoned her son over time and stashed him in her car’s trunk while she partied at clubs was hardly touched upon. I’ve really enjoyed branching out and trying new authors and genres, but unfortunately for me I don’t think I will be reading any other books by Nancy Taylor Rosenberg. Some of the characters, especially Shana, were very difficult to like. Even though she grew as a person throughout the book, I wanted to tell her to grow up and respect her mother. Meanwhile, I wanted to shake Lily and give her some much needed parenting advice. I just don’t think I could sit through another book with these two and their many, many issues. Thank you for the review of this book. I dare say you got the stray bad apple with this one. I have read several of her earlier works and really enjoyed them. Perhaps it is one of those cases of noteriety and pressure to produce too fast for this lastest book. I have seen that happen before.